PET scans are an important part in the diagnosis of cerebral disorders and also in understanding the causes of brain diseases and how they can be treated. They can be used in the identification of movement disorders such as Huntington's and Parkinson's disease, as well as certain types of epilepsy and psychological disorders e.g. schizophrenia. The images are obtained by tracing the blood flow with water labelled with 15O or by glucose metabolism with labelled deoxyglucose which has a hydrogen atom replaced by a 18F atom. The 18F is a better tracer than 15O since the positron emitted from 18F are of a lower energy and so it travels a shorter distance before it reacts with an electron to form two detected photons and so it is more accurate. However, blood flow gives a better indication of brain function since it is more sensitive to activity than glucose consumption. In addition, 15O has a half-life of 2.1 minutes whereas 18F has a half-life of 118 minutes. This means the scan of the blood flow can be repeated up to 12 times per session so that change in cerebral function can be monitored for different tasks so that the activity of different areas of the brain can be imaged. In contrast, deoxyglucose accumulates in the brain over a 30 minute period and so a task will need to be carried out for this period of time. This technique is therefore employed for monitoring continuous mental states or the change caused by a drug if it has a slow effect. 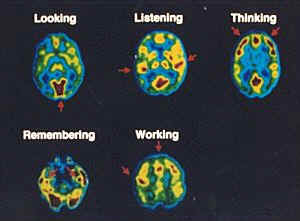 Epilepsy - Blood flow and glucose uptake are measured by PET in order to identify seizure sites in the brain. In 80% of patients there is an increase in blood flow and glucose metabolism during a seizure in the cerebral cortex. However, between seizure there tends to be a lower than normal glucose uptake and blood flow. 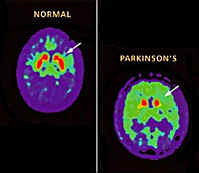 Parkinson's Disease - Patients have a higher than normal blood flow to the basal ganglia on the opposite side to the effected limbs. L-dopa reduces the blood flow to the basal ganglia but over time can increase the local metabolic rate. 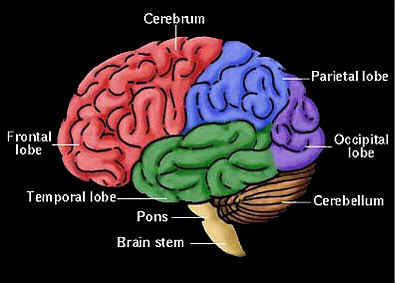 There is also a lack of communication between the frontal and parietal and the frontal occipital lobes. Glucose metabolism is also decreased generally over the brain by 18% compared to a normal person of a similar age. 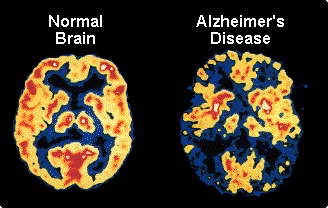 Alzheimer's Disease - PET scans show in patients with mild Alzheimer's and in more advanced cases glucose metabolism is reduced in both the temporal and parietal lobes. Patients with a greater amount of language dysfunction than problems with spatial sight display a significant reduction in metabolism in the left frontal, temporal and parietal lobes. Cases with greater visual spatial impairment have a diminished glucose metabolism in the right parietal lobe. Brain Trauma - Damaged areas of the brain have a reduced or no blood flow or glucose metabolism. This can be seen in the images below where there has been a blow to the head by a rock.